This equipment set from Forster America comes with all of the tools needed for stainless steel frame manufacturing. (4x) 30mm Clamping Arm (bronze v block) – Steel finish, chrome. With sliding and pivoting clamping element. Arm 30mm with v-block in a bronze finish. (6x) Flat Clamp – Steel finish, chrome. With sliding and pivoting clamping element. Pad 30 mm (1.2 in) with V-pad in a bronze finish. (4x) Try-Square (aluminum) – Right angle bracket with locking screw for the table top. Aluminum, with outer surface machined and chrome. Provides a precise 90º angle surface to securely hold weldments in place. 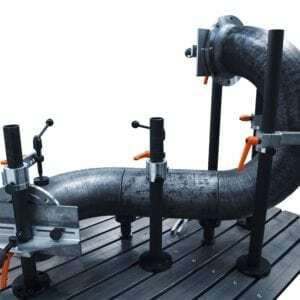 (4x) 30mm Clamping Column – Precision steel pipe, chromated with slot nut and shaft collar. (5x) 70mm Edge Angle (aluminum) – For straight and right-angle positioning of components along the edge of the table. Clamping side slightly chamfered for secure fitting. Chromated aluminum with a screw top. (6x) Quick Release Clamp w/Flat Stop (aluminum) – For clamping sheet metal and small components. Quick-release clamp can be freely positioned along the x- and y-axis with the integrated flat stop. (2x) 350mm x 350mm Universal Angle – Aluminum finish. With two locking elements. Can be used as a left and right angle stop.